Breakfast is the most influencial meal of the day. If you start your day with sugary pastries or a greasy breakfast sandwich, the rest of your food choices will follow suit. However, when you start your morning with a wholesome and nutritious meal packed with protein and healthy ingredients you’ll be more likely to continue with good choices throughout the day. 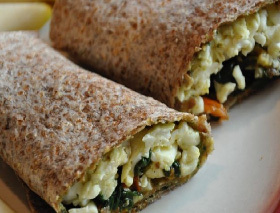 Try this Spinach & Egg White Wrap recipe below as a nutritious start to your day. This wrap is delicious for breakfast, lunch or dinner. It’s ready in a flash, tastes amazing, and is filled with lean protein, veggies and whole sprouted grains. Try it today, and don’t be surprised if you get hooked! Spread a tablespoon of pesto over each tortilla and set aside. In medium sized skillet warm the olive oil over medium heat. Add the garlic and sauté until golden. Add the tomato and cook for another 3 minutes. Add the spinach and cook until it is soft and wilted. Remove the veggies from skillet, set aside in a bowl. Pour the egg whites into the skillet, season with salt and pepper. Cook until the egg is no longer runny. Arrange half of the egg whites in a line down the center of each tortilla. Top with half of the veggies and then fold the ends up and wrap like a burrito. Nutritional Analysis: One serving equals: 288 calories, 10g fat, 28g carbohydrate, 6g fiber, and 21g protein. This is an utterly delicious recipe with a good amount of protein. If you don’t have time to cook in the morning try it on the weekend. Here are some other ideas on how to get enough protein throughout the day.